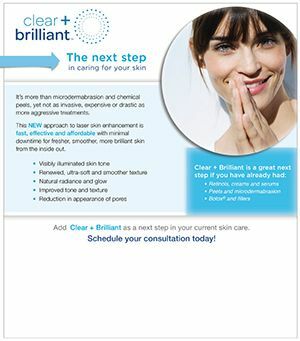 As part of our cosmetic dermatology services, we introduce Clear + Brilliant™. A new approach to laser skin enhancement. Aging skin is a fact of life. The good news is the earlier you start taking care of your skin, the more you can prevent the signs of aging and maintain a younger look. What you do in your 20s and 30s will affect how you look in your 40s, 50s and beyond. Adding Clear + Brilliant to your collection of skin care tricks – at any age – will help you recover the glow, luminosity and smoothness your skin, and you, deserve. Click on a brochure below to learn more. Clear + Brilliant takes skin care to a whole new level. 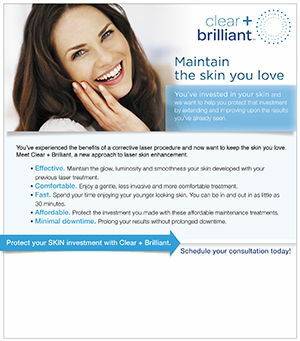 I have had corrective laser treatments, is Clear + Brilliant right for me too? Yes, absolutely, Clear + Brilliant is a great way to maintain the investment you have made in your skin, extending and improving upon the results you’ve already seen. Clear + Brilliant is very safe* when used by a trained expert who will evaluate your skin and recommend the best course of treatments for your unique concerns. Contact us today to schedule an appointment for this revolutionary laser treatment. Indications for use include dermatological procedures requiring the coagulation of soft tissue and general skin resurfacing procedures.